How do we develop products customers will love? We always ask ourselves, what do our customers really want? We often debate whether customers even really know what they want. However, one thing that is certain and unchanging is that customers ultimately buy your product or services, and you need to know what will positively influence that buying decision. Therefore, the question we should be asking is: How do we successfully develop products that customers will actually want to use? Business Leader and Marketing Professional, Burke Adler offers a theory of what makes products “resonate” with customers. Adler suggests that customers can associate or identify with products that share several common characteristics. 1. Solving an urgent need: Products that respond to an immediate need and/or reduce some form of pain, frustration or yearning will be in demand. You can also greatly influence the buying decision when you communicate to customers your clear understanding of this sense of “urgency”. 2. The products are “pervasive”: Beyond an urgent or short-term need, products that solve an ongoing or regularly occurring problem, in your customer’s daily life, are more likely to produce loyalty and generate business growth for your organization. 3. Customers are willing to pay the price and purchase the product. Alder emphasizes that “the price customers are willing to pay should be worth the cost of building or providing it.” The value proposition must clearly resonate with your customers and the marketplace. How do you know if your product is solving an urgent need? What is the pervasive problem that your product is solving? Are customers willing to buy this product? Is your organization in tune with marketplace needs? 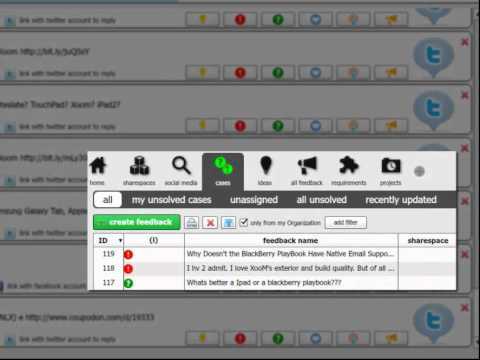 OneDesk features a built-in social media monitoring application that allows you to monitor conversations on the social web and get valuable information to answer these questions. In today’s fast paced world customer needs are always evolving. It is imperative that you obtain information in real-time, so that ideas, suggestions, requests and issues—all valuable insights–can be elaborated and incorporated into the process that develops products customers will love.